If Snare! is accessed from R&D, the Runner must reveal it. If you pay 4credit when the Runner accesses Snare!, do 3 net damage and give the Runner 1 tag. 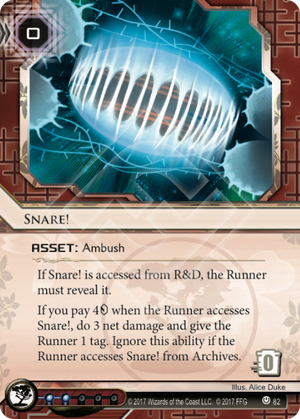 Ignore this effect if the Runner accesses Snare! from Archives. This does everything a Megacorp could want to Runner scum. It tags, it takes away most of their hand, and it punishes random accesses. Random accesses, let us not forget, are a runner's major path to victory. I was playing as Personal Evolution last week, and the runner asked me how many credits I have: I gestured to the four tokens and said "Snare! credits". It's what we were both thinking. A Jinteki kill deck has one of three amounts of credits: less than four (so they can't fire Snare! ), at least four (so they can fire snare! ), or nine or more (so they can get account siphoned but still afford to fire Snare!). Some corporate economists would argue that nine actually means "Komainu+Snare!" or that the credit total "eight" exists as double-Snare!, but there's mostly academic difference between that and nine. A simple, elegant and most of all fun piece of design, this adds so much to the game. But, you may be thinking "this is fun, but only for the corp". And that, dear reader, is where you're wrong. Snare! in the pool leads to wonderful moments of relief when that card you accessed isn't a Snare! It lets the runner experience the feeling, generally reserved for the corp, of losing to an unlucky R&D access. It gets installed in an iced-up remote, and gets revealed like a bad punchline. It allows for really great moments of bluffing and double-bluffing, intricate interplay to accessing cards which may or may not be Snare!s and which runners may or may not be able to afford to not check. It's the major reasons you don't run last click. And of course, as a runner, there's no greater feeling than trashing an unfired Snare! for free. It adds a ton of fun swingy variance in the game, which can be heightened with play skill. One of the best and most important cards in the game. Just don't rez it or you're doing it wrong.